Quirky old Bollywood movie poster of the Hindi film Parasmani (1963) for sale. Printed and circulated several years after the first release of the film (somewhere in the 1970s), this quirky old Bollywood movie poster was originally designed for publicity of the film but never ended up being used. 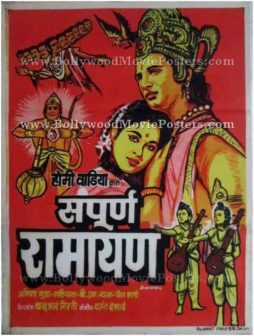 This is an actual surviving publicity poster of the fictional adventure Parasmani, which has the distinction of being one of the rarest films in the history of Indian cinema to be shot both in black and white as well as in colour (the first half of the film was shot in black and white and the second entirely in Eastman colour). Directed by the pioneer of cinematic effects in Indian cinema (Babubhai Mistri), Parasmani was an attempt to wow the audience with special effects that were previously unseen in Bollywood. Parasmani (Gem) is a film about one man’s quest to find a rare gem that has the power to grant eternal life. The film traces the lead actor’s epic journey during which he encounters magical creatures, dragons, gigantic spiders, sorcerers and sorceresses. This old Bollywood poster was originally designed by a small time poster art studio in Kolkata, making it very collectable. A large dragon is seen on one side of this quirky old Bollywood movie poster with the lead couple in a romantic pose on the other side. 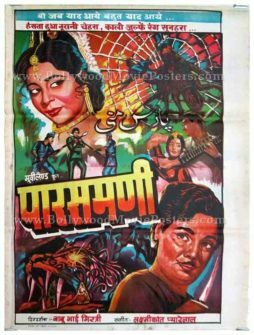 This beautiful quirky vintage Bollywood movie poster for sale features a dragon predominantly on one side. On the other side the lead couple is seen in a romantic pose, with the hero holding a classical musical instrument, trying to woo his lady love. The poster exudes the plot of the film which revolves around the lead protagonist’s quest to locate the gem of eternal life, “Parasmani” in order to win his lady love. This 1963 musical fantasy film featured pioneering cinematic effects for the time period it was released in. The musical also had the distinction of being first film in which Bollywood’s most successful music composer duo Laxmikant Pyarelal worked independently on together. The film is remembered till date for its unforgettable songs delivered by Mohammed Rafi and Lata Mangeshkar. 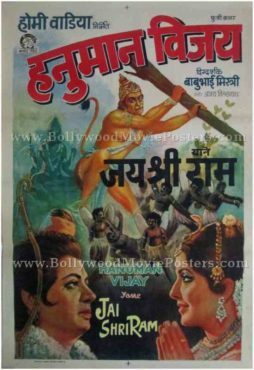 The popularity of the songs has been highlighted and used in the publicity of the film as seen in this poster, which features the opening verses of two of the most popular songs in the film, “Woh Jab Yaad Aaye” & “Hansta Hua Noorani Chehra” on the top. Quirky hand painted vintage Bollywood poster of the Hindi film Parasmani (1963) for sale. 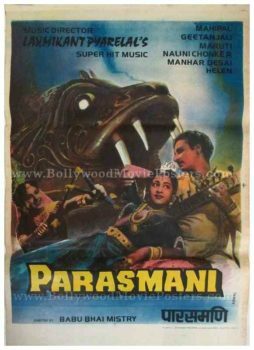 This is an actual surviving poster of the fictional adventure film Parasmani, which has the distinction of being one of the rarest films in the history of Indian cinema to be shot both in black and white as well as in colour (the first half of the film was shot in black and white and the second entirely in Eastman colour). Parasmani (Gem) is a film about one man’s quest to find a rare gem that has the power to grant eternal life. The film traces the lead actor’s epic journey during which he encounters magical creatures, dragons, gigantic spiders, sorcerers and sorceresses. Printed and circulated somewhere after the release of the film, this quirky hand painted vintage Bollywood poster was originally designed for publicity of the film but never ended up being used. This vintage Bollywood poster was originally designed on a hand painted canvas by a small time poster art studio in Delhi, making it very collectable. This beautiful hand painted vintage Bollywood poster features the lead actor fighting giant spider and dragons. On one corner of the poster he is seen holding a classical musical instrument, trying to woo his lady love. The plot of the film revolves around the lead protagonist’s quest to locate the gem of eternal life, “Parasmani” in order to win his lady love.